A Cardiff mum is supporting Adult Learners’ Week 2018 after education restored her confidence and helped her build a career. After agreeing to an arranged marriage at the age of 18, education was the furthest thing from Aqsa Ahmed-Hussein’s mind. By 28 she had lost her confidence, seeing herself as just a wife and mum, but when Aqsa’s fourth child was due to start school she knew she needed to update her skills to support her family. She completed several courses including computer skills, child psychology, counselling skills and a teaching assistant course, all of which gave her the skills she needed to find a job. 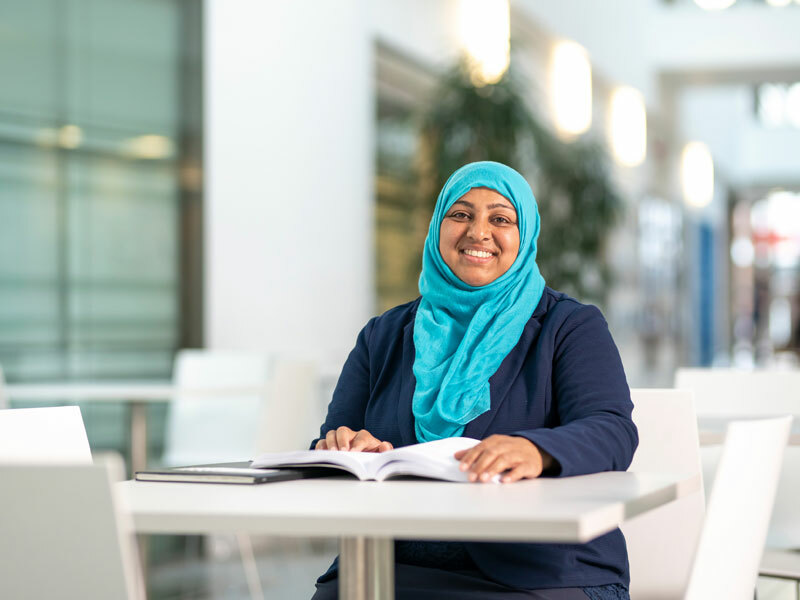 Now 41, Aqsa works full-time as a one-to-one classroom assistant at Kitchener Primary school and is considering further training to become a teacher. Aqsa is supporting Adult Learners’ Week 2018, which takes places from 18-24 June to highlight opportunities to continue developing and learning new skills as an adult and celebrate the positive impact of adult education on skills and employability. “I was still in my final year of A-Levels when I had an arranged marriage with a relative from Pakistan. I had the option to say no, but at the time I felt it was right. We married in Pakistan and I returned to Cardiff to complete my exams, but my priorities had changed. Instead of studying I spent all my time preparing documents for my husband’s visa and working part-time to support his application. “I was predicted A’s and B’s, but I got very poor results and decided to re-sit the year. By then my husband’s visa application had gone through, and I didn’t worry about getting qualifications or a career because in my culture the husband provides for his wife. After several years, and with the support of her family, Aqsa started to re-gain her confidence and focus on improving her health. She met and married a man who encouraged her to follow her ambitions and supported her desire to learn. “I didn’t know anything about adult education. My initial reason for enrolling on the computer course was so I could help my children with their homework. One course led to another and I went on to more advanced courses, expanding on the basic skills I’d learned. “I loved learning again, I didn’t realise how much of myself I’d lost until I went back to education. When I was in high school I was so confident and outspoken, but over time I’d started to see myself as ‘just a mum’. Through learning, I felt like I was getting my identity back. I started to think about possible careers, and I’d loved raising my own children so much I decided to look at teaching. I started volunteering at my daughter’s school to get some experience and enrolled on a teaching assistant course. “After my course registered with a teaching assistant agency and was offered a temporary position within just a few weeks. I screamed with joy when I found out and my girls were thrilled for me. Their support kept me going through difficult times, and their love and positivity helped me not to give up. I felt so proud when my eldest daughter started university, continuing in my own learning journey has made me a better role model for my children. Adult Learners’ Week 2018 is running from 18-24 June and celebrates lifelong learning, whether work-based, as part of a community education course, at college, university or online. Now in its 27th year, it aims to promote the range of courses available to adult learners, from languages to computing or childcare to finance. “We often think of education as something we do when we’re young, but learning is a lifelong activity. “Aqsa is a perfect example of someone who has benefited from the opportunity to go back into education as an adult. Adult learning has been linked to improvements in health, overall wellbeing and social engagement. We want to ensure every person in Wales has access to the skills they need to help our communities thrive. “Going back into education has enormous benefits for adults. The evidence shows that it can improve your health, family life, the chance of a job, or a promotion at work. Taking that first step back into adult education might seem a little daunting at first but there is always someone to lend a helping hand and to support you along the way. Adult Learners’ Week is funded by The Welsh Government and the European Social Fund and organised by the Learning & Work Institute Wales. For more information on Adult Learners’ Week, go to www.careerswales.com/skillsgateway or call 0800 028 4844 or follow @skillsgatewaycw.